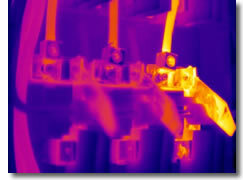 Infrared Scanning – IEC Integrated Engineering Consultants, Inc.
Infrared Scanning – IEC recommends infrared thermography for our Clients predictive maintenance programs. The benefits of infrared diagnostics of typically concealed mechanical, electrical, or structural problems, without tampering with the building’s structure or mechanical systems, cannot be overstated. Finding and fixing a poor electrical connection before a component fails can save you the much greater costs associated with manufacturing downtime, production losses, power outages, fires and catastrophic failures. Using infrared scanning for predictive maintenance, IEC’s Clients are assured of reduced downtime, improved safety results, and the highest ROI for every maintenance dollar spent.